The time has come, and that time was 14 April 1966 . Washington, April 14 — Some 350 persons who disapprove of the war in Vietnam announced today that they would not voluntarily pay their Federal income taxes, due tomorrow . They urged others to join them in this protest. The Internal Revenue Service immediately made clear that it would take whatever steps were necessary to collect the taxes. The group announced its plans this morning in an advertisement in The Washington Post. The first signature on the advertisement was that of Joan Baez, the folk singer. Others who signed it were Staughton Lynd, the Yale professor who traveled to North Vietnam last year in violation of State Department regulations, and the Rev. A.J. Muste, the pacifist leader. 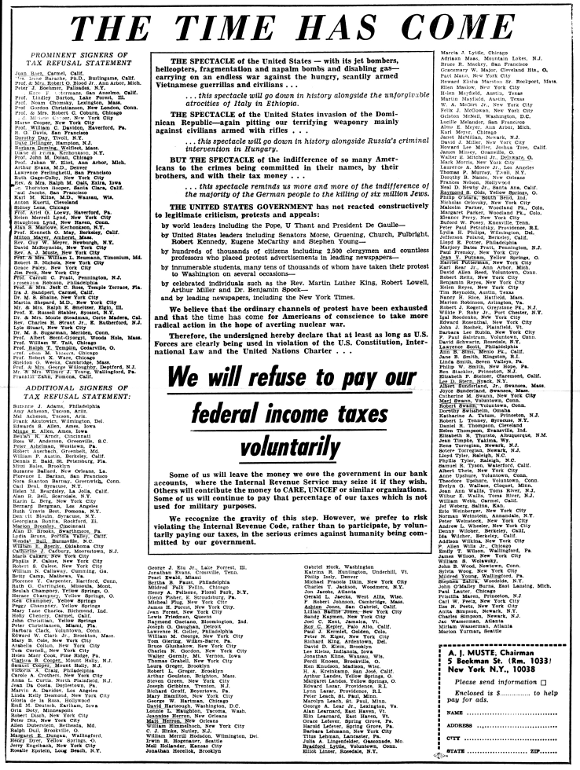 The advertisement contained a coupon soliciting contributions for the protest. The ad said that further information could be obtained from Mr. Muste at Room 1003, 5 Beekman Street, New York City. The determination of Internal Revenue to collect the taxes the Government is owed was expressed in a formal statement by the Commissioner of Internal Revenue, Sheldon S. Cohen. The Government has been upheld in court on all occasions when individuals have refused to pay taxes because of disapproval with the uses to which their money was being put, revenue officials said. A spokesman for the committee said that Mr. Muste, the chairman, was out of town and would return in about a week. The spokesman said that although monetary contributions in response to the advertisement had not yet begun to come in, the committee was prepared to mail literature explaining its program to those who responded to the advertisement. The committee announced that members would appear at 2:15 P.M. today in front of the Internal Revenue Service office, 120 Church Street, to distribute leaflets concerning the tax protest. It also said that a rally and picketing would be staged from 11 A.M. to 3:30 P.M. , in front of the Federal Building in San Francisco under the sponsorship of the War Resisters League. The league also has offices at 5 Beekman Street. With press coverage like this, including even the address to write to for more information, Muste hardly needed to pay for ad space in the Times (assuming they would have printed the ad — many papers rejected ads like this). Some other names I recognize from the ad are Noam Chomsky, Dorothy Day, Dave Dellinger, Barbara Deming, Diane di Prima, Lawrence Ferlinghetti, Milton Mayer, David McReynolds, Grace Paley, Eroseanna Robinson, Ira Sandperl, Albert Szent-Gyorgyi, Ralph Templin, Marion Bromley, Horace Champney, Ralph Dull, Walter Gormly, Richard Groff, Irwin Hogenauer, Roy Kepler, Ken Knudson, Bradford Lyttle, Karl Meyer, Ed Rosenthal, Maris Cakars, Gordon Christiansen, William Davidon, Johan Eliot, Carroll Pratt, Helen Merrell Lynd, E. Russell Stabler, Lyle Stuart, John M. Vickers, and Eric Weinberger. The spectacle of the United States — with its jet bombers, helicopters, fragmentation and napalm bombs and disabling gas — carrying on an endless war against the hungry, scantily armed Vietnamese guerrillas and civilians… this spectacle will go down in history alongside the unforgivable atrocities of Italy in Ethiopia. The spectacle of the United States invasion of the Dominican Republic — again pitting our terrifying weaponry mainly against civilians armed with rifles… this spectacle will go down in history alongside Russia’s criminal intervention in Hungary. But the spectacle of the indifference of so many Americans to the crimes being committed in their names, by their brothers, and with their tax money… this spectacle reminds us more and more of the indifference of the majority of the German people to the killing of six million Jews. and by leading newspapers, including the New York Times. We believe that the ordinary channels of protest have been exhausted and that the time has come for Americans of conscience to take more radical action in the hope of averting nuclear war. Some of us will leave the money we owe the government in our bank accounts, where the Internal Revenue Service may seize it if they wish. Others will contribute the money to CARE, UNICEF or similar organizations. Some of us will continue to pay that percentage of our taxes which is not used for military purposes. We recognize the gravity of this step. However, we prefer to risk violating the Internal Revenue Code, rather than to participate, by voluntarily paying our taxes, in the serious crimes against humanity being committed by our Government. Some people use income tax time to send an anti-military message to the government. “Some people think tax resistance is an extreme thing to do,” muses Steven Broil, “but you have to be as extreme and active as the people you’re opposing. Money talks.” An increasing number of people are using April 15th as an opportunity to talk back. According to a recent General Accounting Office report, tax resistance rose sharply in tax years 1979 and 1980 , with a 400 percent increase in the Northeast. Accurate estimates of the number of war tax resisters are difficult to arrive at. The IRS has a category called “illegal protesters,” in which it placed 6,694 individuals in 1978 and 15,285 in 1980. According to the War Resisters League, those figures are a gross underestimate. There might be as many as 200,000 people resisting taxes from any principled position, including at least several thousand specifically protesting military spending. IRS figures would also not include individuals using wholly legal means to resist war taxes. And both the War Resisters League and the Conscience and Military Tax Campaign report a groundswell of interest since President Reagan took office. Steven Broil, who stocks shelves in a store in Amherst, Mass., last year found himself for the first time owing the government money at tax time. He happened to hear an announcement on the radio of a number to call about war tax resistance, and after a conference with veteran tax resisters Wally and Juanita Nelsen [sic] of nearby Deerfield, he decided not to pay the $255 he owed. He filed and enclosed a statement of his decision of conscience instead of a check. Breaking the law was not an easy thing for Broil to bring himself to do. Last year, a series of “Dear Taxpayer” letters ended with threats to garnish his wages or seize bank accounts, although neither happened. This year, his giving false information on his W-4 withholding form and deciding not to file a tax return at all make him liable to a year’s imprisonment and a substantial fine. Although he points out that Wally and Juanita Nelsen have been resisting for 30 years and Juanita was only jailed once for an hour, he knows that the government could create difficulties for him. Erin Freed of the Pioneer Valley War Tax Resisters points out that it usually costs the government more money to pursue tax resisters than it will collect, a good reason not to bother. On the other hand, the tax system relies on voluntary compliance, and the IRS must crack down on “avoidance schemes” that appear to be popular. Hence there is great variance in the government’s response to war tax resisters. One PVWTR member had the $600 in his checking account seized without notice during his second year of war tax resistance, while another member received his first phone call from the IRS nine years after he began to resist. Since court trials of war tax resisters are expensive and may generate publicity favorable to the cause, they are few and far between. From 1948 to 1971 seven pacifist refusers were criminally prosecuted, from 1972 to 1978 none, and in 1979 there were two criminal convictions. The roughly $2,000 that he owes the IRS has been contributed instead to an alternative fund administered by the Pioneer Valley War Tax Resisters, a local group of about a dozen longtime members, “We feel we can do a better job with our money than the government can,” explains Broil. “We put the money toward life-affirming purposes.” Part of the money in the fund is reserved for legal fees a member might need, but most of it is loaned to local groups who don’t have access to mainstream funding. So that people like himself can satisfy both their consciences and the law, he supports the passage of the World Peace Tax Fund bill, first introduced in the Senate in 1977 by Senator Mark Hatfield and now with 333 co-sponsors in the House of Representatives. The bill would provide taxpayers with the opportunity to identify themselves on their 1040 form as conscientious objectors to war taxes. The portion of their income tax that would otherwise go to the military would instead be deposited with the World Peace Tax Fund and be available only for peaceful purposes. Another project he supports is the Conscience and Military Tax Campaign, coordinated by four activists in Bellport, N.Y. Signers of the resolution they circulate pledge to withhold at least the military portion of their income taxes when notified that 100,000 people have signed the resolution. CMTC also administers an escrow account to hold refused taxes. Yet Eccleston urges people not to wait for the safety of numbers. The important thing to him is taking personal responsibility and going on record against preparations for nuclear war.